Use the form below to contact tour Hue city tour full day directly. 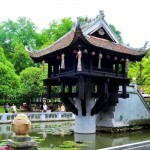 Huế is well known for its historic monuments, which have earned it a place in UNESCO’s World Heritage Sites. The seat of the Nguyễn emperors was the Citadel, which occupies a large, walled area on the north side of the Perfume River. Inside the citadel was a forbidden city where only the emperors, concubines, and those close enough to them were granted access; the punishment for trespassing was death. Today, little of the forbidden city remains, though reconstruction efforts are in progress to maintain it as a historic tourist attraction. At 7.45 am, our guide and driver pick up you at your hotel and then take a full day to discover Hue: visit Emperor Minh Mang’s Mausoleum, Emperor Khai Dinh’s Mausoleum, Performing Programs of VO KINH VAN AN – Vietnam Traditional Kungfu and Emperor Tu Duc ’s Mausoleums. Stop on the way to see how conical hats and incense sticks are made. Lunch at a local restaurant. Pm: In the afternoon, visit Imperial capital during Nguyen Dynasty and the seven – storey Thien Mu Pagoda on the riverbank. Return by boat on the gentle Perfume River and do not miss the sunset on the river. You will come back your hotel around 5.00pm. End of your Hue city tour full day. Thank you for visiting our Hue city tour full day. We are looking forward to serving you.